Nextiva and Vonage offer VoIP business phone service with call controls, mobile apps, and a virtual receptionist. Nextiva’s pricing starts at $19.95 and is good for businesses wanting a combination of standard features at an affordable price. Vonage’s pricing starts at $19.99 and is right for businesses wanting a customizable phone system. Nextiva ranks as our best VoIP provider and business phone system, making it a good choice for businesses that want a turnkey phone system with features like unlimited calling, phone numbers, and virtual fax. With a conference bridge that allows up to nine people, Nextiva is also a good choice for teams with small conferencing needs. Vonage is the right choice for businesses that want a basic phone system with a la carte options like call recording and conference bridge. It’s also great for organizations wanting a solution with CRM integrations. Vonage sets itself apart as a scalable VoIP system that allows companies to add features as the business grows. 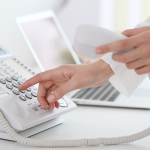 VoIP providers equip businesses with phone systems to place, answer, route, and manage phone calls. Many also offer features like voicemail, CRM integration, virtual faxing, local and toll-free phone numbers, and international calling. Top VoIP providers should also be affordable and have easy to use phone systems with top-notch customer support. Price – We evaluated the pricing structure of both phone service providers and compared package costs on a per-user basis. Features – We assessed the types of features each provider offered, including voicemail to email, mobile apps, call recording, and online fax. Call Management – We assessed the types of call management tools each provider offered, such as call hold, transfer, screening, and park. Virtual Receptionist – We evaluated each provider’s automated attendant for greeting and routing calls. Ease of Use – We assessed how easy the service is to set up and use. Customer Support – We evaluated the type of customer service support each provider offers and hours of availability. Based on our research, we recommend Nextiva for businesses that want a VoIP phone service provider with a great combination of standard phone features at a reasonable price. We suggest Vonage for businesses that want a service provider that offers add-on features to create custom phone plans that scale as you grow. Both Nextiva and Vonage provide many features for a good price. What sets them apart is that Vonage is more of an a la carte option while Nextiva has tiered pricing plans that offer a range of available features. For more options, check our comparison between Nextiva and 8×8. Nextiva offers three tier packages: Office Pro, Office Pro Plus, and Office Enterprise. Prices range from $19.95 to $27.95 per user per month and include unlimited calling, free phone numbers, and unlimited fax. Nextiva’s pricing is equal to or somewhat less expensive than Vonage, depending on the plan selected. Nextiva Office Pro plan includes unlimited domestic calling, a free local and toll-free phone number, voicemail to email transcription, and unlimited fax. However, it doesn’t offer Nextiva Anywhere, call recording or the conference bridge featured in Nextiva’s upper tiers. This tier is also missing the mobile app and team messaging found in Vonage’s first-tier price plan. This level is still a good choice for small businesses and teams that want basic phone service at the most affordable price. As the plan starts at $19.95 per month per user (depending on the number of users on the account), pricing for this tier is roughly the same as Vonage’s first level plan. Nextiva Office Pro Plus package adds a mobile app that combines voice, instant messaging, screen sharing, and other collaboration tools users can access from a desk phone, mobile device, or computer for softphone calling. This level also adds a conference bridge for a call with up to nine participants. This level is missing call recording and the Nextiva Anywhere feature found in the highest tier. Depending upon the number of users on the account, pricing, which starts at $20.95 per month per user, is approximately the same or could run slightly cheaper than Vonage, and is a good choice for businesses with remote workers and distributed teams. Nextiva Office Enterprise package adds call recording for inbound and outbound calls for $27.95 per month per user. It also includes Nextiva Anywhere, a feature that allows users to make and receive calls from any device and any location using a single phone number. This level is a good fit for businesses with no physical location and users who want a unified calling experience across all devices. Depending on the number of users on the account, this plan may cost the same or less than Vonage’s highest-level tier. Furthermore, it comes bundled with features like virtual fax, comprehensive call recording, and local and toll-free phone numbers that Vonage charges an extra additional monthly fee to access, further equalizing the price between providers. Vonage has three package choices: Mobile, Premium, and Advanced. Prices run from $19.99 to $29.99 per user per month and include unlimited calling, a mobile app, and a virtual receptionist. Vonage’s base packages are similar to Nextiva, but add-on features may drive monthly costs higher. Vonage Mobile includes unlimited calling, a mobile app, voicemail to email transcription, music on hold, and team messaging through the mobile and desktop apps for $19.99 per month per user. It doesn’t include the multi-level auto-attendant, CRM integration, or call group featured in Vonage’s upper tier levels. This tier is a good choice for remote and distributed teams or businesses that don’t rely on desk phones. This tier lacks the free local and toll-free phone numbers and online fax offered by Nextiva’s first-level price plan. However, a local number is available for an additional $9.99 per month, a toll-free number is $39.99 per month, and an unlimited use, toll-free paperless fax number is $14.99 per month. Pricing for this tier is initially equal to Nextiva, but costs add up quickly with optional extras. Vonage Premium adds a multi-level auto-attendant feature to Vonage’s virtual receptionist, allowing callers to self-select how they reach a department or employee. This level also adds CRM integration with popular business platforms like Salesforce, G Suite, Office 365, and Zoho for $29.99 per user, making it right for companies and sales teams wanting a business phone system that communicates with their business apps and customer relationship tools. This tier lacks the conference bridge feature included with Nextiva’s mid-level plan, but it is available as an add-on option for an additional $14.99 per month plus $0.03 per minute. Each call accommodates up to 30 participants, while Nextiva’s conference bridge allows up to nine people. This tier costs a few dollars more than Nextiva’s mid-level plan, with optional features adding more to the bottom line. Vonage Advanced adds a call group that forwards calls to multiple extensions while ringing simultaneously, visual voicemail, and onboarding support. It also includes 15 hours per month of on-demand call recording that allows employees to decide when they want to record calls. This tier is a good choice for businesses that want to equip teams with additional productivity tools and have a dedicated team help with setup and onboarding. This tier lacks Nextiva’s comprehensive call recording feature that allows admins to record inbound and outbound calls always, never, or on-demand. However, 500 hours of company-wide automatic call recording is available as an optional add-on for $49.99 per month. This tier costs more than Nextiva’s highest-level plan, but businesses who only need on-demand call recording save money by not purchasing the add-on recording option. Ideally, VoIP phone setup should be a straightforward process and ongoing service easy to maintain. Apps and features should be intuitive and approachable no matter the user’s technical skill level. While evaluating Nextiva and Vonage, we looked at what customers had to say about each provider’s ease of use. Nextiva customers report setup is easy thanks to the support team’s onboarding process. Users say the mobile apps are intuitive and configuring new phones is a smooth process. However, some customers say the desktop dashboard is a bit cluttered. Vonage customers say it’s easy to set up a new account using Vonage’s New Customer Training online guides, videos, and live trainer-led sessions. Users also report that the automated wizard, which guides new users through the process, is also helpful. However, some customers say the mobile app isn’t as intuitive as the desktop app. When you invest in a VoIP business phone system, you want to know they’ll be there when you need them if something goes wrong. While assessing Nextiva and Vonage, we took a look at the types of customer support each provider offers, including online knowledge bases, live chat, and when their phone lines were open for taking calls. Nextiva’s customer support includes an online ticketing system, comprehensive online knowledge base, live chat, and phone support from 5:00 a.m. to 6:00 p.m. AZ, Monday through Friday, and 6:00 a.m. to 6:00 p.m. AZ, Saturday and Sunday. Vonage’s customer support includes an online knowledge base, a company-hosted community support forum, an online ticketing system, live chat, phone support from 8:00 a.m. to 12:00 a.m. EDT, Monday through Friday, and 9:00 a.m. to 9:00 p.m. EDT, Saturday and Sunday. Emergency on-call, after-hours support is also available. When considering VoIP business phone service providers, it’s important to consider what customers have to say about their experience with Nextiva and Vonage. When we looked at our User Review Pages to learn what each company does well and what each one doesn’t, Nextiva emerged as the clear winner. Our readers give Nextiva a four out of five-star rating, with a particular emphasis on good call quality and an easy onboarding process. Customers also say the company’s support team is responsive and friendly. However, some users report a few of the online manuals are outdated. For more user reviews, visit our Nextiva Reviews Page. Our readers give Vonage a three out of five-star rating and highlight how easy the desktop and mobile apps are to use. Customers also report the voicemail to email feature is a big convenience. However, some users report issues with call quality and dropped calls. For more users reviews, visit our Vonage Reviews Page. Nextiva and Vonage both offer great VoIP business phone service with similar features at a comparable price. While Vonage offers the opportunity to customize a phone plan based on individual business needs, Nextiva pulls ahead for companies that want a ready-made solution with a great set of features at an affordable price. If your business is ready for a turnkey VoIP business phone system that comes with unlimited domestic calling as well as local and toll-free phone numbers, we recommend Nextiva. The company offers a free demo of its product when you contact the sales team. Visit Nextiva’s website for details.